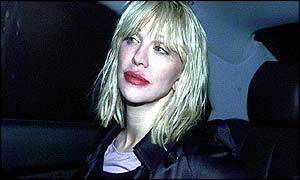 Courtney Love has blamed her bad language for the alleged air rage incident that led to her arrest at London's Heathrow Airport on Tuesday. As she left Heathrow's police station Love said: "I cussed at a lady - my daughter always said I had a potty mouth." Love, former lead singer of the band Hole and widow of Nirvana star Kurt Cobain, was arrested after accusations of verbally abusing crew members on a flight from Los Angeles. She was later released with a caution for "causing harassment, alarm and distress" after nine hours in custody. When asked what it had been like inside the police station, the singer said: "It was fine. They were wonderful in there. It was like being on Prime Suspect." She told waiting reporters the "brief verbal disagreement" had been "highly exaggerated". Love said she had complained that staff did not let her friend sit in first class with her. When asked how she felt about her treatment at the hands of the airline, the singer said: "I have been flying British Airways for a long time and I will continue to do so. "This is my second time on Virgin and my first time wasn't so great either." The crew said they tried to calm Love down but that she refused to sit in her seat and put her seatbelt on. The captain called the airport as Flight VS08 was on its approach to Heathrow. The aircraft was carrying 201 passengers and 20 crew. Staff on the ground alerted police who were waiting for her as the plane touched down. Police went on board and spoke to Love for 20 minutes before she emerged from the Virgin Upper Class cabin. Wearing bright red lipstick and sunglasses and waving and smiling to passengers, she was ushered into a police van. Love is in London for a concert at the Old Vic Theatre on Wednesday night, hosted by Sir Elton John and actor Kevin Spacey. This is not the first time rock stars have been at the centre of allegations about bad behaviour on board planes. In October 1998, former Stone Roses singer Ian Brown was jailed for four months for using threatening behaviour towards an airline stewardess and captain on a flight from Paris. In the same year Cathay Pacific banned Oasis from its flights after a rowdy episode of drunkenness involving singer Liam Gallagher. In April last year, REM guitarist Peter Buck was cleared of attacking British Airways staff on a transatlantic flight to London.